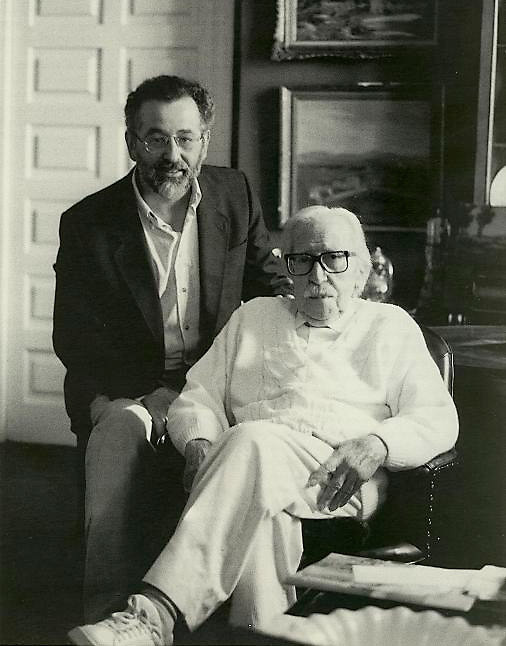 Daniel Quintero (on the left of the picture) sitting next to his teacher, D. Amadeo Roca (1996). 1949 Daniel Quintero was born in Málaga. The first part of his childhood is spent between that city and Melilla. 1959 He and his family go to live in Madrid. 1965 At the age of 16 he studies for four years drawing and painting under the tutelage of Amadeo Roca at the Roca Academy. 1967 While still learning under his master Amadeo Roca he enters the Beaux Arts School of San Fernando and the Beaux Arts Circle of Madrid. 1969 In his third year at the Beaux Arts School he signs his first contract with Juana Mordó Gallery, Madrid. 1975 He leaves the Gallery Juana Mordó and signs a contract with Marlborough Fine Art London. 1976 Lives and works in Cornwall and London. 1978 He lives and works in Dublin (Ireland). 2001 He lives and works between Madrid and New York. 2004 Rents an atelier in Brooklyn, New York for four years. 2007 Has an atelier in Hossegor (France) and in Madrid (Spain). 2008 He was made Academician of the Royal Academy of San Telmo, Málaga (Spain). 2011 After thirty six years working in collaboration with the Gallery Marlborough Fine Art of London, he decides of his own accord to leave and work on his own. 2016 At the present moment he is working on several fronts and exhibiting his work both in England and Spain.